The first trailer for Between Worlds has arrived. It's been quite the year for Nicolas Cage, who has spent the last chunk of his career largely relegated to home video action flicks. Which is a true shame, given how talented the man can be in the right project. But he's been on the rebound lately and, with any luck, this bizarre looking supernatural flick could be the next step on Cage's reascension to greatness. The trailer starts off rather strangely, with an accident leading to tragedy and some ominous Nic Cage narration. We then switch to what seems to be some ghostly, supernatural POV before getting to the meat of the whole thing. It devolves into a thriller involving dead people coming back to life (? ), or so it seems. Creepy music. Lots of eerie shots with very little context. All that's made totally clear is that Cage's character hasn't totally let go of his past and that's proving to be problematic as it relates to these supernatural beings in the trailer. Between Worlds follows Joe, a struggling truck driver who remains haunted by the memory of his wife and daughter, who died in a fire. Joe's life takes a turn when he meets Julia, a woman gifted with mysterious spiritual powers. Her daughter, Billie, is currently in a coma. Julia manages to convince Joe to help her in stopping Billie from crossing over to the spirit world. However, once Billie awakens, her body is possessed by none other than the spirit of Joe's dead wife. Nicolas Cage kicked off the year with the horror flick Mom and Dad, which maybe wasn't universally loved, but it was a remarkable step in the right direction. But it was the recently released ultra-violent arthouse madness that is Mandy, which has been praised on a near-universal level by critics, that has given us reason to think the Cage renaissance is upon us. 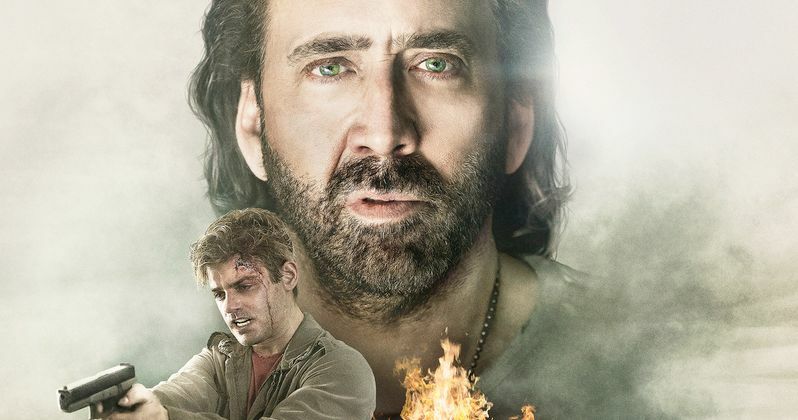 And not for nothing, but the last time we saw Cage play a character named Joe was in David Gordon Green's criminally underseen movie Joe, which was one of Cage's best performances in recent memory. That bodes well for Between Worlds, to some degree. It may finally be time for Cage to make a major comeback into the mainstream spotlight in a meaningful way. The cast also includes Franka Potente, Penelope Mitchell, Garrett Clayton, Lydia Hearst, Brit Shaw and Hopper Penn. The movie recently screened at Fantastic Fest and critics who viewed it seem to be split right down the middle. If nothing else, this at least looks a bit more interesting than some of Nicolas Cage's recent Redbox-worthy efforts. Audiences will have the chance to weigh in on writer/director Maria Pulera's thriller for themselves when Between Worlds arrives on December 21 in theaters and on demand. Be sure to check out the new trailer from the Saban Films YouTube channel for yourself below.